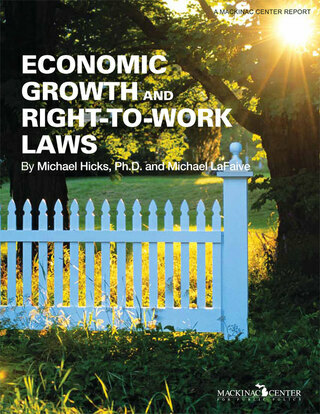 Reed reviews and develops differing theoretical arguments regarding the wage effects of right-to-work laws. For instance, the presence of right-to-work may permit so-called “free riding” by non-union workers, which may erode the strength of unions to bargain and potentially reduce the wage premium for workers. Further, right-to-work laws may increase the need for unions to demonstrate their effectiveness to current and potential members by securing higher wages and benefits and providing members with better overall representation. These two arguments, both of which are plausible, may even occur simultaneously. Also of interest is the role that right-to-work plays in firm relocation decisions. This is especially relevant to research questions which address the time differences in right-to-work effects. The impact right-to-work laws may have on firm productivity is also important to consider. Some argue that right-to-work laws weaken unions, lessen their influence at work sites and make work arrangements more flexible, efficient and productive. By contrast, others propose that higher wages purportedly paid to workers in non-right-to-work states draw in more skilled and productive workers. Finally, it is likely that wages and benefits are not the primary cost differential between union and non-unionized firms. Other matters may play a bigger role in firm location decisions, including the costs of negotiating with unions and abiding by onerous work rules involving everything from hiring to firing and worker flexibility. These types of influences would be captured in a statistical model as a function of the cost of production, and may be more pronounced in those industries with higher levels of human capital, such as government and the service sector. Including these differences in our statistical models is relatively straightforward. Assuming > 0 yields some straightforward results. If and then . Likewise if and then . The uncertainty surrounding the direction of the impact of unionization which has led to such unclear theoretical reasoning is not merely cause for an exercise in labor-demand modeling. It is likely that productivity and wage effects of unions vary by industry and time. So, the conditions outlined above provide strict relationships, which in their aggregate may vary significantly. This paper seeks to help answer the temporal aspects of these strict relationships. As we model the effect of right-to-work laws, we suppose that it affects unionization negatively, but transmits to the aggregate economy through an uncertain pathway. This leaves the effect of right-to-work laws largely an empirical question, for which considerations on the identification of a model is of paramount importance. For example, right-to-work laws may well have been influenced by initial union conditions (or local preferences). Thus, strong unions in industrialized states may have blocked the legislation, while less industrialized states would be more likely to endorse right-to-work legislation. These heavily industrialized states may enjoy manufacturing clusters that continued to attract new firms seeking the benefits of agglomeration, so may incidentally result in . Also, during periods of rapid employment growth in heavily unionized sectors, unions may have served as employee screening tools for employers, and so boosted profitability. Later, as employment declined, unions may have aided in the retention of low productivity workers thus reducing productivity. Conversely, the convergence of state-level industrial structure in the past half century would tend to increase the amount of unionized industries (primarily manufacturing and transportation since mining, a heavily unionized industry, is not particularly footloose) in states that had historically low levels of manufacturing. This well could have occurred without any consideration of right-to-work laws. So, the benefit of theoretical reasoning to model the impact of right-to-work on wages, firm location decision, and industrial composition legislation will necessarily be subordinated to the empirics of the matters. The research findings in this area are important to the analysis offered in this paper.